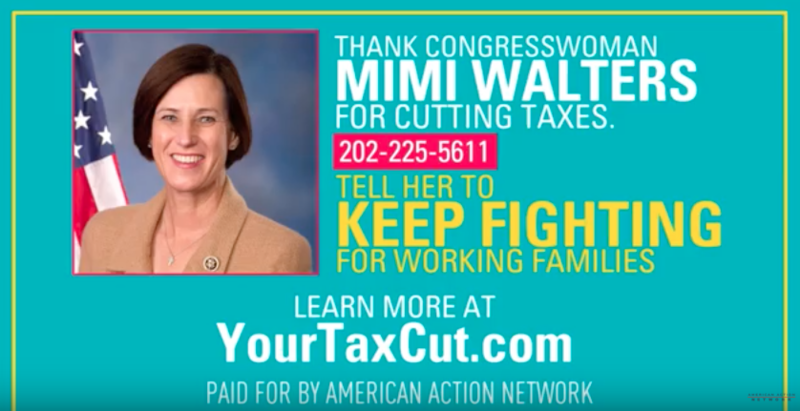 WASHINGTON – The American Action Network (@AAN) is launching a new $1 million television and digital advertising campaign in 26 congressional districts as part of an ongoing campaign to promote the benefits of the Tax Cuts and Jobs Act. The district-specific ads highlight the middle-class tax cuts by the numbers: three million Americans receiving bonuses, fastest wage growth in eight years, and working families receiving a tax cut of $2,000. View the districts targeted here. AAN began educating Americans about changes to the tax law immediately following its passage by launching T.V. and digital campaigns touting the benefits of the Tax Cuts and Jobs Act. Since August 2017, AAN has spent over $30 million promoting the Tax Cuts and Jobs Act and highlighting how the new savings benefit working, middle-class families. Watch an example of the ad here. ANNOUNCER: The middle-class tax cut by the numbers. Three million Americans received bonuses. Wage growth fastest in eight years. Consumer confidence highest in almost eighteen years. Working families saving two thousand dollars a year. That’s more money for a mortgage. More for groceries and gas. More to save for college and retirement. Then thank [Member of Congress] for cutting our taxes. And tell [him/her] to keep fighting for working families.